I read this article and found it very interesting, thought it might be something for you. The article is called Why Ragpickers, Unrecognised And Unpaid, Are Critical For Waste Management In India and is located at https://archive.indiaspend.com/cover-story/why-ragpickers-unrecognised-and-unpaid-are-critical-for-waste-management-in-india-43164. 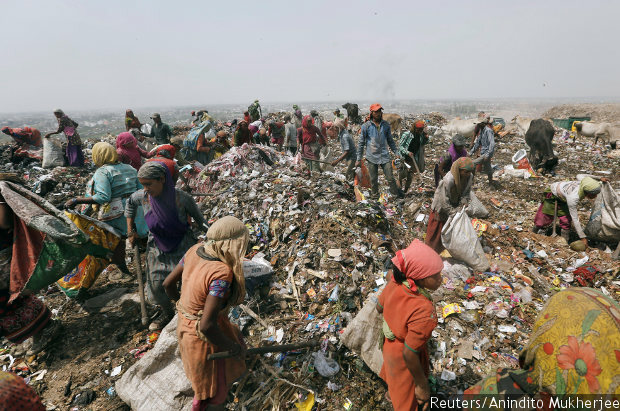 Ragpickers collect recyclables from a dump yard in New Delhi. By 2050, India will be generating 450 million tonnes of garbage annually and ragpickers–who work without any job security, dignity or safety gear, exposed to health hazards, harassment and abuse on the streets–will have to be an important part of its waste management plans. The Ajmer Shatabdi pulls into the New Delhi station every night at around 11 pm. During the six-hour journey from Ajmer, the train serves tea, snacks, soup, dinner and dessert–more food than an average person can eat in that time. As soon as passengers start getting off the train, ragpickers jump in and start scrounging for waste material and leftovers–samosas, biscuits, plastic bottle, wraps and so on. They are a part of India’s massive reserve of ragpickers–their numbers are estimated between 1.5 million and 4 million; Delhi itself has over 500,000. Ragpickers sustain themselves by collecting, sorting and segregating waste and then trading it. In doing so, they help clean up a significant proportion of the 62 million tonnes of waste generated annually in India. Given that rag-picking is a totally informal sector it is hard to quantify how much waste is collected in this manner, but there are rough indicators: Only 75-80% of the waste generated in India is collected by municipal bodies. And more than 90% of India does not have a proper waste disposal system. A lot of garbage clearing thus is the done informally, by ragpickers who work without any job security, salary or dignity. Not just that, they are regularly exposed to cuts, infection, respiratory diseases and tuberculosis apart from poverty, humiliation, harassment, and sexual abuse on the streets, as IndiaSpend investigations found. “This informal sector has saved the country. They are doing a good job and I have decided to recognise their efforts. We will grant (a) national award,” former environment minister Prakash Javadekar had declared in 2015 at an event on waste management in New Delhi. It was declared that a cash prize of Rs 150,000 ($2,330) would be given to three ragpickers and three associations involved in innovative waste management. More than a year later there is no information available about the scheme. The environment minister has stated that India will, in another couple of decades, generate nearly thrice the waste it currently does–“165 million tonnes by 2030 and 450 million tonnes by 2050”. Only 22-28% of the waste now collected is processed or treated. The problem is particularly acute in cities. Per capita waste generation rate in Indian cities ranges between 200 and 870 grams a day and is rising. Between 2001 and 2011, growing urban population and increase in per capita waste generation has resulted in a 50% increase in the rubbish in Indian cities. The government traced this to changing consumption patterns and consumer behaviour. Ragpickers actually complement the work of civic bodies, Shashi Bhushan Pandit, who runs the All India Kabadi Mazdoor Mahasangh, pointed out in this March 2016 interview. Toxics Link, a New-Delhi based environmental NGO, classifies waste pickers into four categories: Those who carry sacks and collect anything of resale value from open drains and bins; the kabadi or bhangar men on bicycles who collect from households and then segregate glass, paper, and bottles from plastics; those who ride tricycles and collect almost 50 kg of waste each day and travel long distances to sell them, and finally, those who work for scrap dealers. The occupation exposes these workers to toxins, the International Archives of Occupational and Environmental Health shows. They have little or no access to protective gear. Darkness Under the Lamps was a study undertaken by Harsh Mander and V Manikandan in 2011 at the Centre for Equity Studies in Madanpur Khadar, an urban village in south Delhi where many ragpickers live. They complained that they were treated “with suspicion and derision, because of their extreme poverty, vocation of rag-picking, minority faith and suspicions that they are from Bangladesh by the middle-class community living around (sic)”. The children of ragpickers often carry on with the same occupation and are rarely educated. The government treats them no differently. Pandit has demanded inclusive rights, health benefits, safety gear and social security for ragpickers because they provide services that benefit the environment. “In Bogota, Columbia, every ragpicker is paid $2 per day by the municipality. In Brazil, they have made sure that only the ragpicker can pick the waste (from the source). Why can’t India do it?” he asked. In September 2016, with the support of the Kachra Kamgar Union, we visited a ragpickers’ colony near Vasant Kunj, close to the Delhi airport. More than 250 families here depend on rag-picking to earn a living. The men leave their homes early morning with their waste carts. A few of them work where the municipal corporation deposits waste, some scour the roads and others go to specific neighbourhoods looking for kabadi from homes. Each ragpicker has a different story to tell, but they all suffered acute destitution once. Ranjit is a landless labourer from Bihar who came to Delhi seeking employment. Kundan once grazed cattle for a Chhatarpur farm in south Delhi. Another man washed toilets at the Delhi airport before settling down at the ragpickers’ colony. Chandrika, who was a bonded labourer in Bihar and earned 1.5 kg of vegetables for a month’s work, came to Delhi in 1985 when she was very young. “Only the destitute get into this work. Some of us are contracted into it by moneylenders who dump several people in a single room and pay them a pittance for their work. Then there are traders who employ ragpickers,” she said. Most ragpickers in this colony, however, work independently. Several men we spoke to agreed that they had tried their hand at other things but came back to rag-picking because it paid better. Migrants here also help their kin to move to Delhi and join the trade. This meant that most people in the basti (neighbourhood) came from two states: Bihar and West Bengal. The women we met do not go out for picking, but are expected to sort waste at home. Even eight- or 10-year-old children join their parents in sorting waste. “If you work 12-14 hours a day, you can make a living. But rates have gone down significantly. A sack of rag that fetched us Rs 300 five years ago now gets us no more than Rs 175-200. See how much rice and vegetables cost now–it is impossible to survive,” complained Kundan. Police harassment is a common complaint. Young boys are picked up on false allegations and beaten up in police stations, said the residents. Sometimes they pick up mobile phones or other lost or stolen goods and then get arrested for committing a crime. However, in this colony, residents said the union ensures that they are not harassed much. Hair and plastic fetch the best rates but sorting waste is a difficult and hazardous job. “We open sacks and there are soiled sanitary napkins in newspapers, human excreta in polythene, shards of glass, syringes or nails. We cut ourselves, develop rashes and infection. Rotten food makes us sick. But we have no pension, no recognition, no medical facilities,” said a ragpicker. When the main earner in a family falls very sick, he or she is packed off to the village to recover. The government hospitals, they alleged, do not want to treat them and they have to opt for expensive private dispensaries. When waste is disposed in India, it is done with little concern for those who will be handling it later. For example, both soiled diapers and sanitary napkins need to be treated as medical waste: According to the Bio-Medical Waste (Management and Handling) Rules, 1998 any waste with faecal, blood, body fluid must be treated separately. But usually these are thrown into a common dust bin. The colony, built on forest land, has no concrete houses–landowners will not allow any permanent construction. Only a third of the households had a ration card. There is no personal or public toilet in the colony, and no electric metres have been installed. We asked a few women hailing from Uttar Pradesh for the one thing they would ask from the government. Disposal bins for the waste leftover from sorting, they said. Without bins, this waste simply piles up in their homes and lanes. “Give us that and access to water. We buy two buckets of water every other day and pay Rs 1,000-2,000 a month to the one person who has a hand pump. If we can get a tanker, we could bathe properly. Yes we deal with garbage, but we want to be able to live in a space that is clean,” the women said. A more detailed discussion and case study of urban poverty in Delhi can be found in the “India Exclusion Report 2016” due to be released on May 12, 2017, by Centre for Equity Studies and Yoda Press. Correction: An earlier version of this story said Papiya Sarkar, the author of the Toxics Link study, is a senior programme officer (chemicals and health) with the NGO. Toxics Link has clarified that the author no longer works with them. Heart breaking yet illuminating story about ‘hidden halves’ of India.